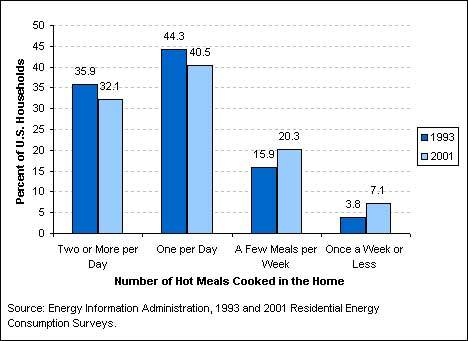 As you can see by the graph below, less than half the US households serve even one hot cooked meal at home per day. 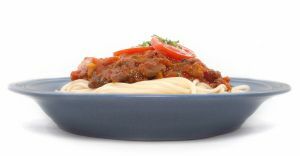 How likely do you think it is that meal was cooked from scratch, and not something like a frozen pizza or browned hamburger with boxed pasta? A decade ago I read a newspaper article that said less than 5% of all women (sexist, I know) had ever made a cake from scratch. Less than 50% had ever made a cake from a boxed mix. EVER! When they wanted a cake, they went to the supermarket and bought one. As someone who cooks from scratch all the time, I was shocked. Making a cake from scratch is one of the easiest things there is. In fact, while cake mixes hit the shelves in the 1930's, up until WWII just about all homemade cakes were made from scratch. Why not? Instead of opening a box, you just toss together flour and baking powder in a bowl with a little sugar, salt and flavoring extract. Then add the oil, eggs and water. It was a flour shortage during WWII that convinced women to even try boxed mixes - and they caught on. I was an adult before I made my first cake from scratch, and then only because of the magnificent pictures and instructions in Rose Levy Beranbaum's "The Cake Bible". So I can understand people only making cakes and cupcakes from a box. It's faster than assembling and measuring ingredients and the results are all but guaranteed (if mediocre). But in this day and age, when Wilton equipment takes a full aisle in Michael's and the Food Network is one of the most popular cable channels, a survey saying fully half the women in America have never baked a cake was quite surprising. 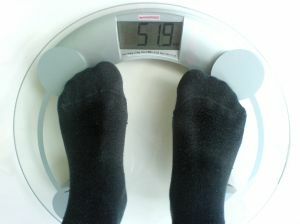 On June 29, 2010, Jeff Levi, executive director of the Trust for America's Health, announced the obesity rate has jumped in 28 states this last year. "More than two-thirds of states now have adult obesity rates above 25 percent" he said. Economic factors are one of the biggest reasons for the increase. With less money to spend on food, making the right choices are even more important. There is no question that you must eat more empty calories in prepared foods to get the same level of nutrition found in fresh whole foods. Prepared foods have made food our enemy. We're afraid to eat too much, afraid to eat at all -- because no matter how much supermarket people chow we stuff into our mouths, our energy levels drop and our bodies cry out in hunger. We are not getting what we need. "The first lady, who said that she had never had a vegetable garden, recalled that the idea for this one came from her experiences as a working mother trying to feed her daughters, Malia and Sasha, a good diet. Eating out three times a week, ordering a pizza, having a sandwich for dinner all took their toll in added weight on the girls, whose pediatrician told Mrs. Obama that she needed to be thinking about nutrition. “He raised a flag for us,” she said, and within months the girls had lost weight." If you can't grow a garden, she said, you should not feel bad. Eliminating processed food. THAT is the key. It is not about "going back" to the way grandma cooked. Grandma never had access to the wide variety of ingredients, the extraordinary equipment, and the cumulative knowledge of many great chefs that we have now. It is about recognizing and valuing what is good, over what is expedient. The voice of this movement is Food Network star and cookbook author Jamie Oliver, who has taken his Food Revolution to a whole new level, encouraging people to leave processed foods on the grocery shelves and choose whole, locally grown ingredients and cook from scratch. Oliver has gone to great lengths to save America's cooking skills in the home and introduce wholesome foods to children in our schools. He is an inspiration teaching people the skills they need to "start a food revolution in your own home", providing recipes, videos, and instruction to master the skills you need to feed yourself and your family. He states it quite simply, "all you need to do is cook something. From scratch. With fresh and raw ingriedients - no packets, no cheating!"